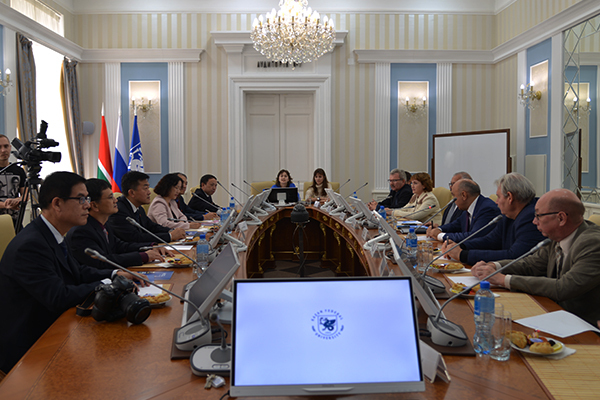 From October4th to 9th, Li Min, Party Secretary of HNU, led the delegation to Moscow Region State University, Kazan Federal University andSaint-Petersburg State Transport University on invitation. 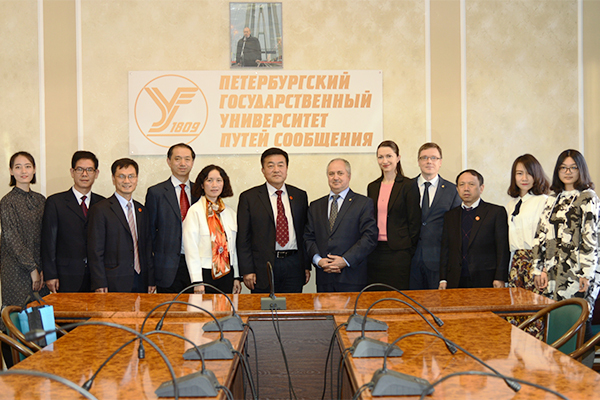 The delegation included Yang Zhen, Director of the Office of Development and Planning, Tang Jianwen, Director of the Office of International Exchange and Cooperation, Xiao Beigeng, dean of College of Law, Liang Yong, Party Secretary of College of Medicine, and Yan Zhike, Director of Russian Department of Foreign Studies College. 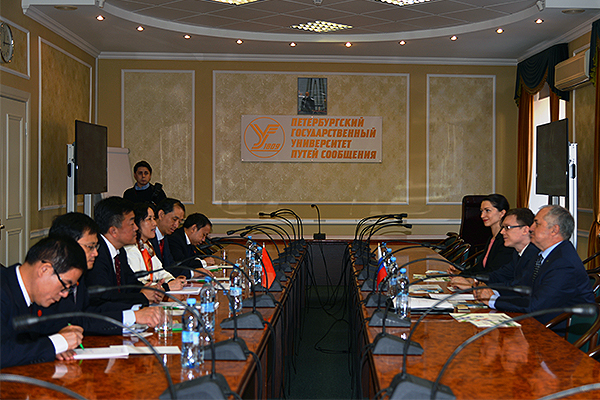 During their visit to Moscow Region State University, both sides held talks with each other and focused on the joint training of students, legal talents exchange, and joint declaration of scientific programs. Party Secretary Li pointed out that Moscow Region State University grew out of Moscow Region StateNormal University, which is of the same type as our school. Both sides share broad cooperation prospects and substantial cooperation and exchange are expected in areas like student exchange, mutual recognition of credits, cooperative scientific research, etc. At last, a cooperative agreement on science and education of both sides was signed by Party Secretary Li and Vice President of MRSU, on behalf of Rector Pavel Khromenkov, President of MRSU. By then, the number of partnership between HNU and Russian Universities had increased to 12. Prof. Ilshat Gafurov, Rector of Kazan Federal University, held a grand welcome ceremony for the delegation. Rector Ilshat Gafurov briefed on the development of KFU and Kazan. Party Secretary Li pointed out that it is of extraordinary significance for the cooperation between KFU, the Alma Mater of Lenin, and HNU, a university in the hometown of Mao Zedong. Both sides expected to innovate cooperation mechanism, conduct deep cooperation in aspects like teacher cooperation, joint laboratory establishment, equipment sharing, cooperation in running schools, etc., and make a good planning on the tenth anniversary of KFU Confucius Institute. After the meeting, Party Secretary Li visited the classroom and seat of Lenin when he was studying in KFU, accompanied by Rector Gafurov. In the company of Latypov, Vice-Rector of KFU, the delegation held a meeting with directors and professor representatives of Institute of Law and Psychology Department in KFU, reaching an intention on teacher exchange and scientific cooperation. They also visited the museum of KFU, and mainly inspected Institute of Oriental Studies, Institute of Fundamental Medicine and Biology, Institute of Physics and Alexander Butlerov Institute of Chemistry. On the morning of October 6th, Party Secretary Li attended and gave a speech in the opening ceremony of “Russia-China: History and Culture” International Academic Seminar, organized by Confucius Institute in KFU. Li pointed out that, under the new international background, the Sino-Russia International Seminar should lay more emphasis on the practical problems faced by China and Russia, and even the whole world, focusing on one theme in each seminar and putting the heads of experts from each side together, in order to make itself into a special characterized academic brand and promote its popularity and influence constantly. The seminar has received near 100 papers from experts and scholars in China and Russia, and over 70 scholars were invited to the seminar. Doctor of Philosophy Peng Dingguang, professor of Research Institute on Moral Culture, was invited and gave a speech on the realization of human right. 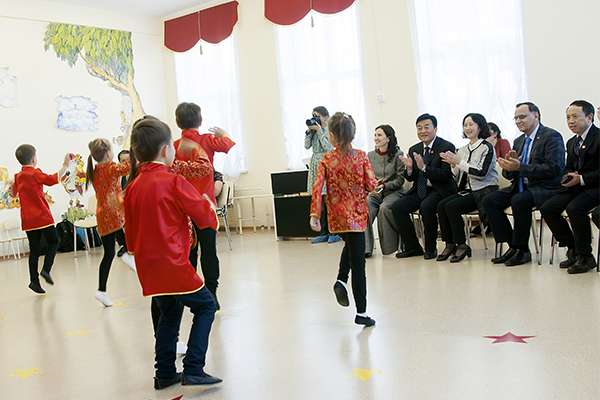 The delegation visited the International Language School in Kazan Children’s World, accompanied by Russian President and Chinese President of Confucius Institute in KFU. 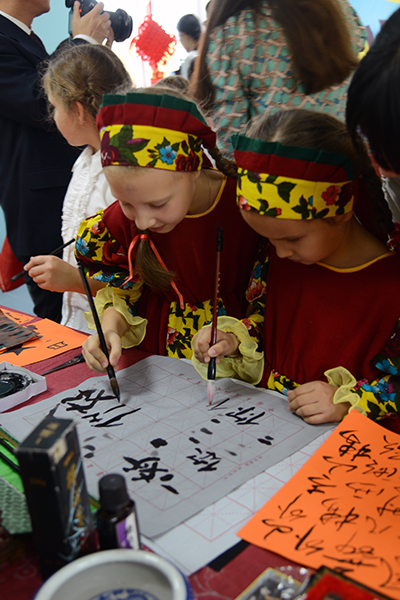 They listened to the songs and watched the dances of Tatar and Chinese feature, inspected the classroom teaching of Chinese, and visited the activity of Chinese Culture Day in KFU, organized by Confucius Institute. At last, a cooperation agreement was signed by the Russian President of Confucius Institute and the president of the International Language School, under the witness of Party Secretary Li Min. According to the agreement, Confucius Institute would fully support the Chinese teaching in the International Language Schooland the establishment of Chinese culture center. Later, Party Secretary Li left a wish note of happy growth in the Chinese culture centre and gave them some materials and facility on Chinese teaching as presents, expressing his best wish of growing healthily and studying hard for the students there. 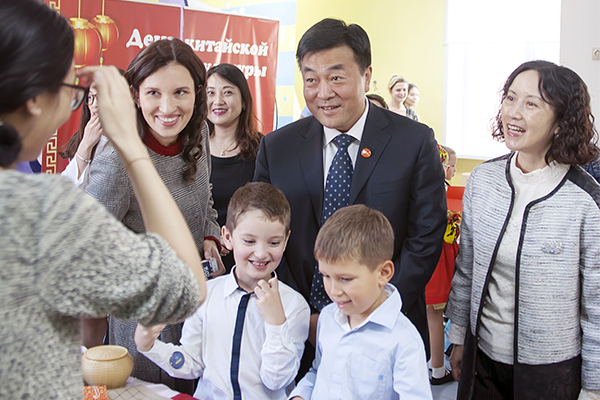 In Kazan, Party Secretary Li condoled with the student representatives of HNU studying in KFU, enquired on their studies and life there, and inspired them to study hard to become the ambassador of Sino-Russia friendship. In Saint-Petersburg State Transport University, the delegation visited its corridor of school history, technology library, Mendeleev Laboratory and simulation laboratory in railroad signal system, and held a meeting with the Vice-Rector of Saint-Petersburg State Transport University. Both sides looked back on the exchange programs in the past three years, discussed on the expansion of cooperation and exchange in the sharing preponderant disciplines, and agreed to enhance cooperation in aspects like joint training of students, Russian teacher recruitment, short-term programs for students in summer holidays, etc. Exchange students of HNU studying in Saint-Petersburg State Transport Universitywere present at the meeting.